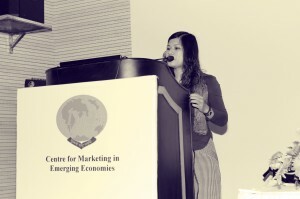 BU doctoral researcher Hai Chung Pham presented at the Annual Emerging Markets Conference in India last month. Her paper, ‘The Western brands among the Minds of Vietnamese consumers”, is collaborative piece of work, developed with Professor Barry Richards from BU’s Media School. Hai presented the findings from a study of brand perceptions of young Vietnamese consumers. The data illuminates the nature of consumer culture in contemporary Vietnam, and provides a psychosocial case study of how globalisation is proceeding in emerging markets. The approach is based on the idea of ‘identity work’, and the role of consumption in providing resources for individuals to experiment with different self-experiences and to develop their social identities. In this paper, Professor Richards and Hai focus on the analysis of their experience of Western brands, and what this reveals about cultural change in Vietnam. The paper provides valuable insights to marketing and advertising professionals, and those with responsibility for consumer regulation in emerging markets. The theme of the 2014 conference was ”Listening to consumers of emerging markets”, which attracted scholars from 30 countries.